Arthur von Ferraris was truly a citizen of the world at a time when that designation was relatively rare. He was born in 1856 in Galkovitz, Hungary, a small agricultural town. Like so many European regions in 1848, Hungary experienced a major reform movement—in this case to oust the longstanding Hapsburg rulers in Vienna. The revolutionaries succeeded, albeit briefly, in creating the first Republic of Hungary only to be completely defeated when the Austrian emperor Franz Joseph called for assistance from the Russian tsar, Nicholas I, who promptly invaded Hungary. By August 1849, the revolution was over, the Hapsburgs were firmly in control again, and the Hungarian people would not sever their political connection to Austria until the end of World War I. Nonetheless, the second half of the nineteenth century was a time of persistent upheaval with reform movements always simmering just beneath the surface of society. In light of this importunate turmoil, it is not surprising that a young painter might want to relocate to a more welcoming environment for the arts. Von Ferraris’ first move was to Vienna during his teenage years, where he was able to understand the language, and begin his art education. His first teacher was the Viennese artist, Joseph Matthaus, who specialized in portrait painting. Intriguingly, Matthaus had fought for reform in Vienna in October 1848, and had been sentenced to death for high treason. He was later pardoned and went on to establish a career painting the leaders of Austrian society. The young von Ferraris must have known of his mentor’s political activities—perhaps even supporting the same ideals. He did not stay long in Vienna however, leaving for Paris in 1876. After settling into life in Paris, von Ferraris studied with Jules Lefebvre at the Académie Julian, and then with Jean-Léon Gérôme at the Ecole des Beaux-Arts. Both these instructors were advocates of classical educational methods, teaching students to draw first, and then to paint. Von Ferraris’ earlier training in Vienna provided him with a solid foundation, facilitating his smooth progress through his studies at the Ecole. He began exhibiting at the Salon des Artistes Français in 1881, just a year after beginning his studies with Gérôme. The next notable journey for von Ferraris began in the winter of 1884-85 when he traveled to Egypt with his friend, Ludwig Deutsch, an Austrian painter who was also living in Paris. Undoubtedly Gérôme encouraged the trip as he so often did when students expressed an interest in Orientalist imagery. Von Ferraris and Deutsch spent a productive winter in Cairo, returning to Paris with a wealth of drawings, oil sketches and possibly photographs. 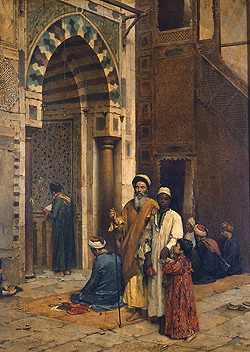 The Learned Man of Cairo, a painting from 1888, is a case in point. Like Gérôme’s paintings, this image is meticulously detailed and almost photographic in its polished realism. Von Ferraris’ style is more intimate, however; he concentrates on what seems to be a portion of a larger scene, suggesting that the viewer is privileged to observe this elderly wise man at his study—unaware of the viewer’s presence. The most apt comparison is to the work of Edgar Degas, whose spatial composition has been described as looking through a keyhole. Nor does the similarity end there; von Ferraris also poses his subject in a corner, distorting the spatial perspective with sophisticated subtlety so that the plane of the stone floor seems to tilt forward very slightly. By 1888, this technique was explicitly associated with the Impressionists, but it is unusual to see it in the academic realists affiliated with Gérôme. By the late 1880s, von Ferraris had set up a studio with another Orientalist painter, Charles Wilda, on the Boulevard de Clichy. He continued to paint society portraits—still a reliable source of income with wealthy clients who preferred the more prestigious oil portrait to the increasingly popular photographic print. These commissions, such as Young Girl in a White Dress, were painted with that unique sensitivity that characterizes a skilled portraitist, emphasizing the essential qualities of the personality while simultaneously highlighting all the best physical aspects of the sitter. Von Ferraris exhibited many of his society portraits at the annual Salon. In addition, his Orientalist paintings were regularly shown at the Salon throughout the late 1880s and early 1890s. A brief list includes: Narghile Smokers (1887), At the El Azhar Mosque, Cairo (1889), Visit of the Great Sheikh to the University of Cairo (1890), A Descendant of the Prophet (1891) and Bedouin at the Arms Dealer (1893). Von Ferraris also won honorable mentions at both of the world fairs, the Exposition Universelle, in Paris in 1889 and 1900. At these international events, he exhibited his work with the Hungarian Section of artists rather than the French group, an indication that he was about to start moving once again. The success of a delightful anecdotal genre painting called The Wise Monkey (Le Singe savant) at the Budapest salon of 1892 was an early sign that von Ferraris had reestablished contact in Hungary. A year later, in 1893, he left Paris for Budapest, where he stayed for the next two years; although the reason for this move remains unknown, it seems probable that family concerns may have required not only his attention, but his presence in Hungary. By 1894, he left Budapest for Vienna, and began to exhibit his work in Berlin as well. Turn-of-the-century Vienna was a particularly exciting place: Sigmund Freud was developing his new science of psychoanalysis; Arnold Schoenberg was composing with his revolutionary 12-tone musical scale; and the Vienna Secession group (led by Gustave Klimt) was proclaiming that art should be free—especially from the stodgy, provincial thinking at the tradition-bound Künstlerhaus. Von Ferraris seems not only to have supported the ideas of the Secession reform group, but also to have become a member in 1898, shortly after it was founded. This would have been in keeping with his best economic interests as well since “foreign” (i.e., non-Austrian) artists were not permitted to exhibit at the Künstlerhaus salons. The next fifteen years were increasingly busy and productive. From his home base in Vienna, von Ferraris also exhibited in Düsseldorf, Munich and Berlin. He traveled frequently throughout the Middle East, returning to Egypt, but also exploring the lands around the Tigris-Euphrates river valley and Palestine. Significantly, his reputation as a society portraitist continued to bring steady, financially rewarding work from international clients. He received commissions in all of the European capitols, adding London, Stockholm and Rome to his already extensive client list. He also made several trips to the New York City where he achieved a certain social status for having painted the portrait of John Davison Rockefeller, the founder of Standard Oil. Regrettably, the peripatetic nature of his work, combined with his natural wanderlust, has left some gaps in the history of von Ferraris’ life. Although there is documentation of his presence in 1920s Vienna, his death can only be dated to an unspecified time after 1928.